In this problem we are given an input file which contains the solar wind protons velocity space distributions obtained from a particle simulation code for an observer located at 1.0 AU distance from the Sun. Simulated observer collects only the solar wind protons with directional velocity range from 0 to 8 *10^5 m/s and velocity resolution of 5*10^3 m/s in all three directions. The magnetic field is constant +5 nT in a with a magnetic vector along Y axis, and the solar wind flows along X axis. 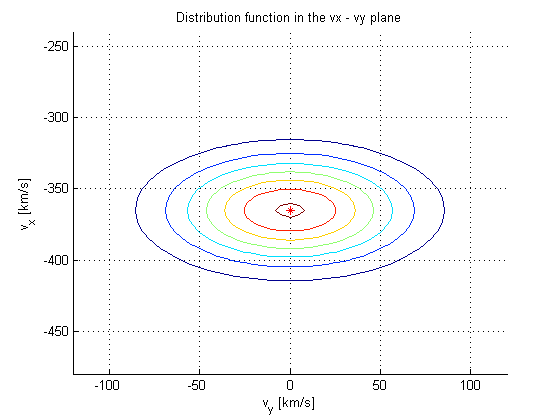 Plot the distribution function in the vx – vy plane and compare it with distribution function in the vx – vz plane. 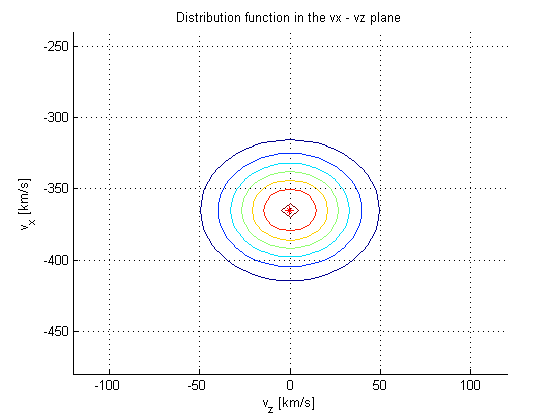 The center of the distribution contours should clearly show the bulk velocity in each plane. The type of the distribution function is Bi-Maxwellian, because the shape in vx – vy is ellipse.